Like the cyborg at its centre, Alita: Battle Angel is the fusion of several notable parts: the manga by Yukito Kishiro; a script co-written by Avatar's James Cameron; and direction by Robert Rodriguez, the Sin City and Spy Kids filmmaker who gets to fashion this cyberpunk story into the biggest budget movie of his career. Brought to life in 3D, it should be spectacular – and after a fashion it is – though this tale of a teen cyborg who discovers her warrior heart isn't on a par with Cameron classics like The Terminator. Set in the 26th century, three years after a savage war dubbed The Fall, the story begins in Iron City, a dumping ground for the waste ejected from Zalen, a pristine floating city above. Down below, Dr Dyson Ido (Christoph Waltz) finds a cyborg head on a scrapheap. He gives her a body and names her Alita. With no memories of her past, she tries to make a future, taking a shine to spirited local lad Hugo (Keean Johnson). Rodriguez has gathered a fine cast: Jennifer Connelly, as Ido's scheming former wife; Mahershala Ali as Iron City despot Vector; and Jackie Earle Haley and Britain's Ed Skrein as two bounty-seeking Hunter Warriors, the latter having a blast as the cocksure Zapan. 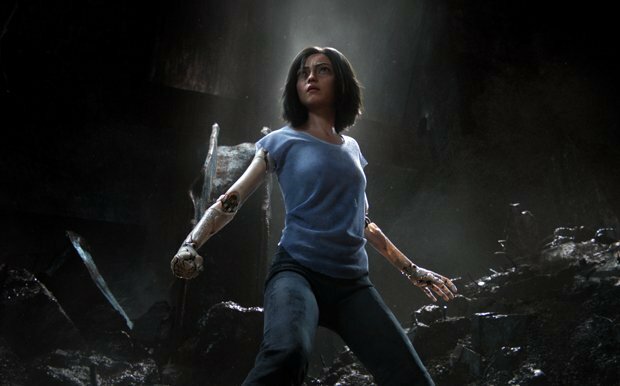 But nobody quite touches the agile Rosa Salazar (of Maze Runner fame), shining via motion capture as Alita, who comes to realise she's a fighting machine. While the CG Alita is a technical marvel, the story never quite matches up to her. A grab-bag of ideas from Rollerball, Ghost in the Shell, Pinocchio, it's missing any real emotional heft. There's something of a YA adventure about it all, and maybe that demographic is where the film will find its biggest audience. But even if her journey lacks substance, Alita herself makes a truly splendid adolescent action heroine. General release from Wed 6 Feb.